The south side of the Dungeon Range is hiked from Loch Trool, situated by Glentrool village, 34 miles southeast of Ayr via the village of Straiton, or 9 miles north of Newton Stewart in the county of Dumfries & Galloway. The village is about 30 houses with a popular small hotel for drinks and meals. The hotel is situated about 1 mile south of the village, named the House o Hill. The Glentrool Holiday Park for camping is close to the village. Glentrool Park is situated about 1 mile east of Glentrool village with a visitor centre, a few car parks, and many walk/cycle paths throughout. Below is a view of the Glentrool Visitor Centre with parking for many cars and signs giving information on the walking and biking trails throughout the park, and around Loch Trool. The signs also give information on astrology as this area is so remote, it is classed as a dark skies area, one of the top areas in the UK for viewing the stars. Below is a view of the Bruce's Stone car park situated about 3 miles east of the Glentrool Visitor Centre. The old road past the monument is loose surface, you are not meant to drive past this point. This car park at the monument can hold about 12 cars, and another car park 3 hundred yards before the stone holds about 30 cars. The well marked Merrick Hiking Trail begins from the sign in the image below. This is the most popular hill in southwest Scotland, so there will normally be a few cars in the car park. Weekends and holidays, you may have to park in the larger car park 300 yards back down the road. The route to the south side of the Dungeon Range is follow the road out east, round to the right past the Merrick sign. 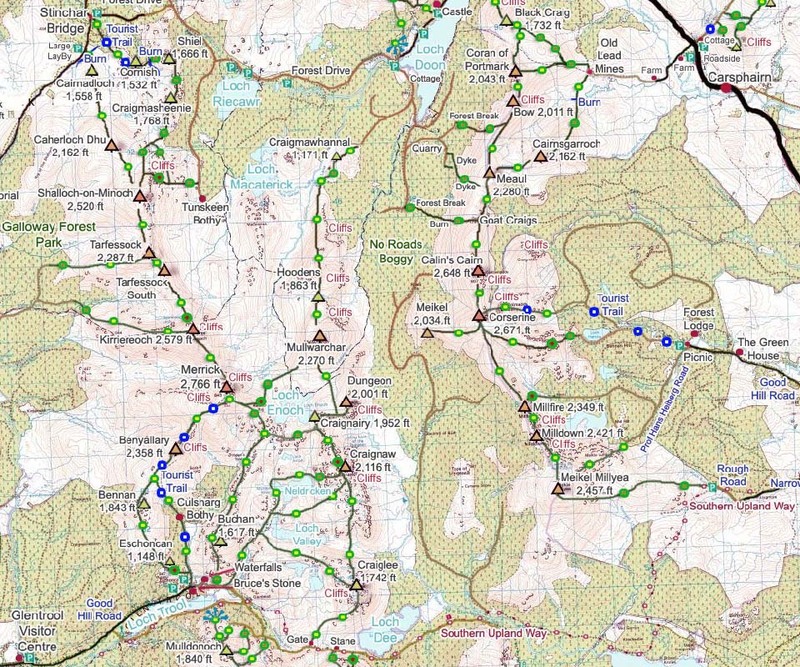 The map below shows the Dungeon Range, or Mullwarchar Range, that runs from Loch Dee in the south to Loch Doon in the north. The map shows the different routes that can be taken. This photo tour starts at the car parks at Bruce's Stone and follows the old road just over 2 miles east towards Loch Dee. The tour then follows a path through a gate and up onto the south side of Craiglee, north to Craignaw, north to Dungeon, across to Craignairy, then back over Craignaw and down past Loch Valley back to the car parks. The image below is from the old road a few hundred yards out from the car park, just past the narrow stone Buchan Bridge. This is the Loch Valley Trail that runs alongside Buchan Hill and up to Loch Valley. This is the trail this hike will be returning back down. You can also return over the top of the Buchan Hill range. The image below is from just over two miles out from the car park along the old road, not far before Loch Dee. This image shows the route onto the south ridge of Craiglee, the furthest south hill on the Dungeon Range. It took about 40 minutes to hike out to here from the car park. You pass an old farm 1 mile out from the car park, from where you can go up onto the hills above the old farm and along the hills to here. That route will add some time to the hike though. The image below is of the route up the south ridge of Craiglee past the cliffs. There was a flat area just below here of fairly deep heather that was not the best hiking, but after that, this is a really good route. It took about 50 minutes to get from the gate to the top. The view below is from Trig Point on Craiglee looking north to Craignaw. The view below is of the route over to Craignaw. The OS Map stated there was no ridge across here which I found hard to believe. Only when I got to this point, did I realize it really was a long way down and back up again. The low point down there is below 700ft above sea level, so about 1,000 ft down and 1,400 ft back up. I headed down the ridge to the left here, across at the narrowest point that was ok going following sheep tracks, then up through the rocks on the south side of Craignaw. The hike to the top of the first ridge is steep, but good going through the rocks. The route up to the second ridge is easier with two small cairns to make your way to on top of the second ridge. From the two small cairns, it is a good steady hike to the summit. Just watch out for the cliffs on the east side of visibility is poor. The view below is is from the top of Craignaw looking north to Dungeon Hill in the sun, and Mullwarchar in cloud. There is a Memorial Plaque on a rock on the top of Craignaw to pilots of an F-111 that crashed there on the 19th December 1979. I have been on this hill twice so far and still to find the plaque. The safest route over to Dungeon Hill from here, is down and round to the left. The other route is straight through the gap in the rocks, as seen in the image below, down a steep section for about 100 ft named the Devil's Bowling Alley, then follow the ridge round to the left. If you go down the route to the left, you should see the Devils Bowling Green, a large flat area of rock littered with little rocks that hikers use to play bowls. The view below is from a cairn on the low point on the crossing. You can see a faint trail leading over to Dungeon Hill. The last part of the hike up to Dungeon is through rocks. There are a few routes that do not require rock climbing. Craignairy Hill is just to the left in this image. The image below is from Dungeon Hill looking down the northeast side to Dry Loch. Mind the cliffs on the east side of Dungeon Hill as they are about 1,000 ft. I hiked out from Loch Doon and down the Dungeon Valley to Dry Loch and Dungeon Loch a few days earlier. The weather was great and there had been no rain for about a week, so the trail down the valley was good going. Got some good images of the cliffs at Hoodens, Mullwarchar, Dungeon and Craignaw, as well as the lochs. The image below is from the cairn on Dungeon Hill looking north to Mullwarchar. It is a fairly straight forward hike across to Mullwarchar, once you have found your way off the top section of Dungeon. Mullwarchar is a fair slog to the top and takes you well out from Loch Trool, turning the hike into a long day. I prefer to hike Mullwarchar from the south side of Loch Doon via Craigmawhannel and Hoodens hills. The hike up the narrow north side of Hoodens past the cliffs is a real good route. The image below is from crossing over west to Craignairy, that is joined to Dungeon. In the low part down to the right in this image, is a small cairn that marks an aircraft crash site. There is a lot of wreckage next to the cairn. Below is an image from Craignairy looking west to Loch Enoch and The Merrick. Some hikers go round Loch Enoch, up the southeast ridge of The Merrick, then back to Loch Trool via The Merrick Trail over Benyallery. 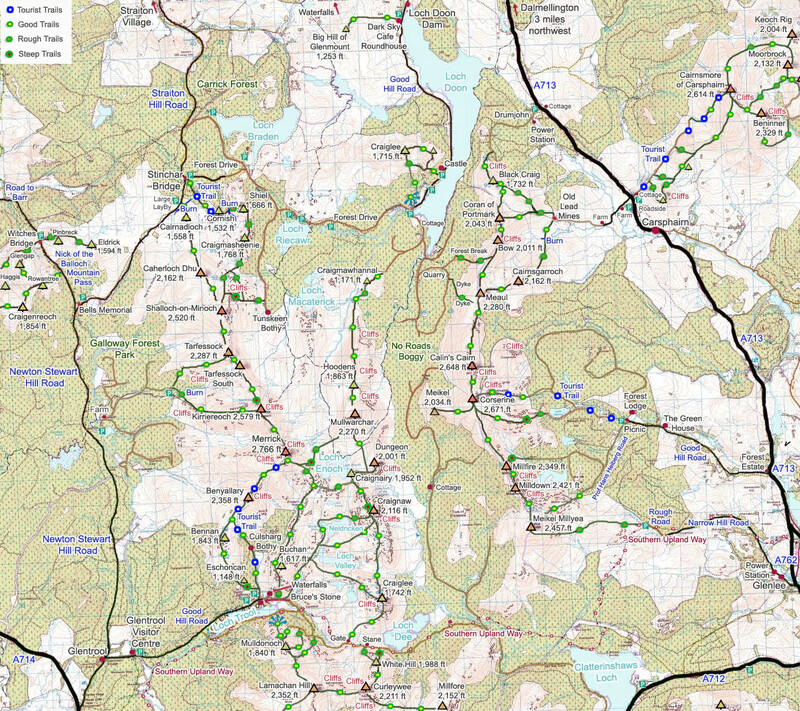 Another route is go round Loch Enoch to the southwest corner, then follow the trail from there onto the Buchan Hill range. That range leads back to Buchan Bridge, a few hundred yards east of the car park at Bruce's Stone. As the Buchan Range route is normally used as the route back down from The Merrick, and I had hiked that route before. I planned to go back round Craignaw, down the southwest ridge of Craignaw to Loch Valley, then down the Loch Valley Trail to Buchan Bridge. The image below is from Craignairy looking south to Craignaw. You can see the Devil's Bowling Alley route to the top of Craignaw from here. You can miss the top of Craignaw on the return by going over the west shoulder, to the right in this image, and head for the two small cairns on the second ridge. From the cairns, head down the southwest ridge to Loch Valley. A straight forward route in clear weather. The view below is from the steep west side of Craignairy looking across Loch Neldricken. The clouds rolled over when I was on top of Craignaw, and I made the mistake of heading southwest too early, ending up going down the steep west side, rather than the easier and more direct route down the southwest ridge. This let me know the steep west side is not too bad a route down, and allowed me a bit of a beach walk on the road back. The beach is made up of a fine granite sand. A narrow trail runs down the west side of this loch all the way to Loch Valley, which is only a few hundred yards south of this loch. The Loch Valley Trail is supposed to run all the way up to Loch Enoch, a very narrow trail, mainly used by anglers and sheep. The view below is looking back across Loch Valley to Craignaw. This view shows the route I should have taken to here. This is the fast way up if you are missing out Craiglee and heading straight for Craignaw and Dungeon. It takes about 1 hour to hike from the car park at Bruce's Stone to here at Loch Valley, then probably about 1 and a half hours from here to the top of Craignaw. The view from here looks like the west side route I came down has un-passable cliffs, but there are a number ways down. These are probably the most dangerous hills in southern Scotland, so best try and hike them on clear days. The image below is from Loch Valley looking down the Loch Valley Trail. The trail follows the Gairland Burn most of the way down, then cuts over to the right and down to the Buchan Bridge, only a couple of hundred yards from the Bruce's Stone car park. The trail has a number of soggy parts, even in a dry spell, so waterproof boots and gaiters are needed. The image below is of Bruce's Stone at Loch Trool in the evening with Mulldonoch Hill over the loch. The hiking car park is right next to the stone here. The hike to Craiglee, Craignaw and Dungeon will average about 7 hours. If you want to hike the whole range in one day, it is best to get dropped off at the south side of Loch Doon and picked up here at Bruce's Stone by Loch Trool. The route up Hoodens narrow north side ridge, past the cliffs, is the best way onto the range. Down the whole range will average between 9 and 11 hours. North Dungeon Range /Mullwarchar Range Page.